Light Kinetics - LED Lighting & Renewable Energy Specialists: Products - Indoor Lighting: Sunlight in a Cable - Bring Sunlight into your environment WITHOUT a skylight! 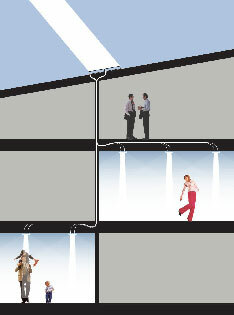 Sunlight in a Cable - Bring Sunlight into your environment WITHOUT a skylight! In this sketch, the simple principle of the Parans System is shown. First, sunlight is collected by Parans Solar Panels outdoors. The sunlight is then brought into the building through the Parans Optical Cables. Indoors, the sunlight flows out through Parans Luminaires. This technology is called Fiber Optic Solar Lighting. The Parans Solar Panel can be mounted on roofs or facades and employs an array of optical lenses to collect and concentrate incoming sunlight. It is easily installed and integrated with buildings’ surfaces to allow for architectural integrity. The Parans Optical Cable is made of several thin fibre optic strands. The cable is thin and flexible. Thanks to the high light transmission, sunlight can efficiently reach many locations far into buildings. In the chosen rooms, the sunlight is emitted through a Parans Luminaire, specifically designed to recreate the feeling of sunlight. A line of luminaires is available to match the outline, purpose and aesthetic of the specific room that is illuminated with the healthy sunlight.